VP Erich opened the Dinner Meeting held on 10 May 2012. President Mavis returned from Bangkok where she had visited the RI Convention today only, and thus she was arriving late for the meeting. Besides the great fellowship, some short talks were given by RCQ members: PP Pok Zin gave a presentation on his recent trip to the Philippines where he had joined TCRP’s Adventure Charity. -Climbing Mount Apo. Furthermore, PP Jack who had been in Shanghai, shared a story of buying books and “future” bookshops. 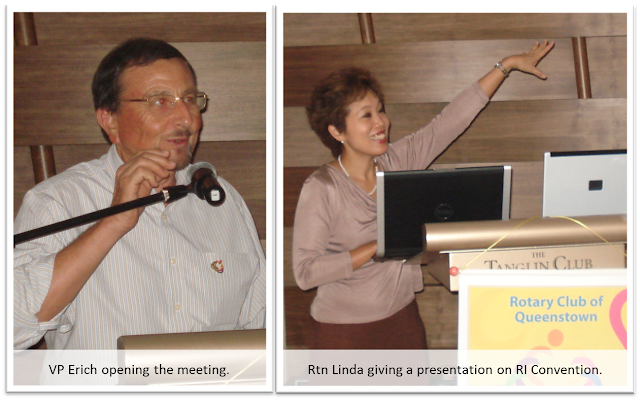 President Mavis and Rtn Linda talked about the RI Convention in Bangkok and showed photos taken there.